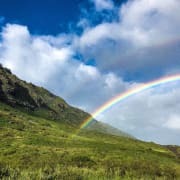 Ka'ena Point State Park needs volunteers! The point is considered a rare coastal sand dune ecosystem and is home to many indigenous, endemic, endangered and threatened plant and animal species. We work to make this place more hospitable to its native wildlife. Come get your hands dirty and learn about Ka'ena's rich natural and cultural history! We have several active habitat restoration sites in the Mokule'ia or north facing section along the vehicle access road. To accommodate the the amount of work required to maintain these areas we hold group work days that include a guided walk to the very tip of the point. Please see our profile here on VolunteerMatch for those group opportunities. Next is March 9th 2019. If you are interested in working with us in ways other than the group work days, please reach out and we can talk about other ways for you to get involved.